The effect of the frequent flooding in the turloughs is to alter profoundly the character of the vegetation. A dense covering of plants still prevails, but its composition is different from that of the limestone pavements or the pastureland around. The contrast between the areas which are subject to flooding and those free from it is increased because intermittent inundation and the very light deposit of limy sediment produce a sward particularly beloved by herbivorous animals, large and small. The vegetation of the turloughs is usually nibbled to the last leaf, and all are much dwarfed. 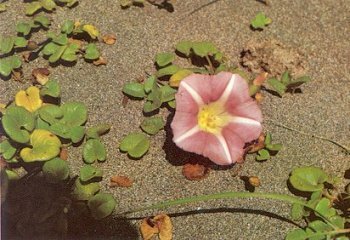 The most abundant plants are those which can best withstand submergence or grazing or both. There is a total absence of rushes, willows, alder and many other plants which one associates with marshes or wet ground. The close sward loses species after species as the depth below flood level increases. The violets in the turloughs show a tolerably regular zonation. Viola stagnina is generally on or near the floor ascending the sides sometimes for a few feet where V. canina appears. This has a vertical range of about 6 ft. Then V. riviniana comes next, still often a couple of yards below the limit of shrub growth; and finally in the woods and adjoining, V. reichenbachiana grows luxuriantly. A great variety of conditions in regard to flooding undoubtedly prevails in different turloughs so that data relative to one would be applicable only partially to any other. Hoary Rockrose (Helianthemum canum) A small creeping shrub, dark green leaves, white on the underside. 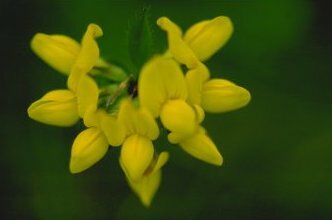 Yellow flowers with five petals on a weak stem. Very local on dry limestone pavements. May-July. Greater Butterwort (Pinguicula grandiflora) Stemless, oblong pale greenish-yellow leaves that are insectivorous with a tendency to curl in. Flowers are violet with five overlapping petals that have wavy margins. On northern-facing wet and dripping rocks. Very rare. July. Maidenhair Fern (Adiantum capillus veneris) Leaves are pale green and fan shaped on slender shining black stems. Local in grykes, often found nestling under the dead growth. Fairly widespread. Fairy Foxglove (Erinus alpinus) A low perennial, small leaves, pink/purple flowers, grows on mortared walls and surrounding boulders. April-May. Dactylorhiza cruenta ssp. D. incarnata Long lanceolate leaves very heavily spotted on both the inside and outside, dark purple flowers also heavily blotched. Turloughs June. Limestone Bugle (Adjuga pyramidalis) Erect, very small plant. Basal leaves very much larger than those at the top which are stemless. Softly hairy. Flowers pale violet-blue. Very rare. Mountain Avens (Dryas octopetala) A low prostate shrub, with creeping woody stems, oak-shaped dark green leaves, white underneath. Creamy-white flowers with classically eight petals, frequently twice that. Widespread on pavements. April-July. Spring Gentian (Gentiana verna) A densely tufted plant with single flowering stems. Flowers with five petals are an intense blue with small white scales between the petals. Found in dense groups or individual plants. Tends to close up if sun is not shining. Abundant on limestone rocks. May-June. Bloody Cranesbill (Geranium sanguineum) Big plant with deeply divided leaves, stems hairy, magenta flowers, with five petals, abundant on limestone and grassy heaths. June-August. Bee Orchid (Ophrys apifera) This orchid resembles a bumble bee. Tall spikes may have three to six blooms on each spike. Slender leaves are green in winter and wither when the flower develops. Dry banks. July-August. Pyramidal Orchid (Anacamptis pyramidalis) This orchid with deep magenta flowers in a short dense pyramidal spike, leaves lanceolate from the base, very common especially on sand dunes. July-September. Lesser Butterfly Orchid (Platanthera bifolia) Tall plant, flowers creamy white, faintly tinged green, spur very long and slender. Damp pastures and heaths. Frequent. June-July. Dactylorhiza o'kellyii ssp. D. fuchsii Pure white orchid, cylindrical in shape, dense flowers, clear leaves, very common grassy heaths, roadsides. July-August. Fragrant Orchid (Gymnadenia conopsia) As the name suggests it has the fragrance of clove, a tall plant with pale pink/reddish-purple loose flowers. Frequent in pastures, heathy grassland. Dactylorhiza majalis Leaves darkish green, spreading, broad and tapered at both ends, often spotted on the upper side. Flowers mauve to deep reddish purple. Marshes, bogs and wet places. May-July. Early Purple Orchid (Orchis mascula) Flowers vary in colour from pale pink to deep magenta on a moderately dense cylindrical spike with a curved spike. Widespread on limestone and grassland. Early April-June. 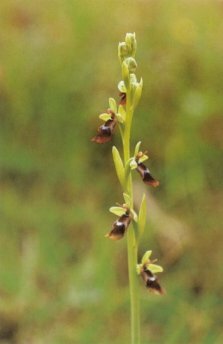 Fly Orchid (Ophrys muscifera) This plant resembles a fly, quite tall with four to seven flowers on each pale green spike, rarely all in bloom together. Infrequent and rare, on fairly sheltered grassy slopes that are not too dry. June-July. Irish Orchid (Neotinea maculata) Few leaves, occasionally spotted, greenish-white flowers that never open out fully, in a dense narrow spike, rather small, faintly fragrant and usually found on grassy heaths, gravel ridges and sandy places. May-June. Spring Sandwort (Minuartia verna) A small tufted perennial, leaves crowed and needle-like white flowers with five petals, high standing stamens. Common over the rocks May-September. Shrubby Cinquefoil (Potentilla fruticosa) A medium-sized shrub with peeling bark, yellow flowers with five petals, leaflets toothed in wet places especially turloughs. This plant blooms twice, once in June and later in August. Fern, Moonwort (Botrycium lunaria) Six pairs of fan-shaped segments surrounds the fertile spike which is usually taller. Sheltered sides of walls. May-August. Dark red Helleborine (Epipactis atrorubens) Lanceolate leaves on a tall (15-30 cm) hairy stem. Dark red cup-shaped drooping flowers. Found on limestone pavements, can show slight differences in colour due to location. July-August. Burnet Rose (Rosa spinosissima) An erect very bushy shrub, flowers single, creamy white, occasionally pink on a very thorny branch. Fruit black. In grykes and rocky places. May-June. A low-growing cushion-shaped perennial. Leaves fine with the segment ending in a small bristle. 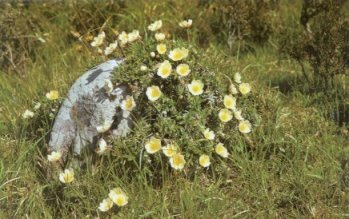 Abundant white flowers on slender stems, clumps of this cover the sea-sprayed rocks. May-August. Calystegia soldanella A low creeping plant with prostrate stems and kidney-shaped leaves rather fleshy. Flowers are bell shaped and single, pale pink, sometimes tinged with white. Sandy seashore June-July. Lady's Tresses (Spiranthes spiralis) Slender stem with white scented flowers in a single spirally twisted row forming a slender spike. Sandy ground near the sea. August-September.